A few years ago, after I gave a speech on Lean at a meeting of the Transformer Association (like the kind on the telephone poles providing electricity to your home), my then six-year old son, Ben, asked me if I’d met Megatron. His question caused me to chuckle at the images we assign to our language. In Lean lingo, the word “transform” is frequently used; I wondered to myself what image the word conjured in others when used in that context. Then, one day last month after attending LEI’s Lean Transformation Summit in Orlando, I took a day off to be a big kid at Universal Studios. And there was it was: Megatron (or facsimile), the object of my son’s earlier admiration. 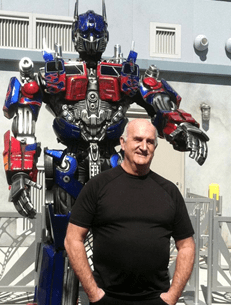 I joined a long line of persons (most a bit younger than myself) to pose for a picture with this ten-foot Bot warrior who, in principle, could transform in shape, size and function to fit the needs of battle: a universal machine, one moment a robot, the next a sports car, an eighteen-wheeler and then a rocket. My sojourn reminded me once more of my son’s earlier interpretation of ‘transformers.’ So I needed to have a souvenir photo to take home for him. For me however, the image of transformation was not about technology or machines, but about the Lean leaders I’d had the pleasure of listening to and speaking with at LEI’s March conference. These transformers were changing the thinking and behavior of entire organizations, creating environments that, in John Shook’s words “make people before making products.” Lean transformer Ken Goodson of Herman Miller related, “Things started to change when we began asking our employees ‘what can we do to eliminate your struggles?’” And from Art Byrne who led the Lean transformation at Wiremold: “People are the only asset that appreciates.” These Lean transformers required none of the technology that went into Megatron, only an abiding belief that our thinking and behavior can be nurtured in a way that unleashes latent human creativity. Perhaps this is not even a transformation, but more of an actualization of human and organizational capabilities; a realization of the way things ought to be or would be if that creativity weren’t systematically hammered out of us by autocratic management behavior and policy. Universal Studios was a whimsical diversion, LEI’s conference an inspiring immersion. A little of both is a good recipe for recharging your batteries. BTW: Speaking of Lean Transformers, there’s still time to register for the Shingo Prize 25th Annual International Conference in Provo, Utah. May 6-10, 2013. I’ll be there for a ‘recharge’ and hope to see you too. This entry was posted in Old Lean Dude and tagged bruce hamilton, continuous improvement resolutions, elimining waste, shigeo shingo, storage, transportation on April 23, 2013 by GBMP. Applause! Great blog post, Bruce! A culture of continuous improvement starts with the people. It is great when we get reminded of the importance of people, I especially like this line of yours, “Perhaps this is not even a transformation, but more of an actualization of human and organizational capabilities; a realization of the way things ought to be or would be if that creativity weren’t systematically hammered out of us by autocratic management behavior and policy.” It reminded me of something else I have learn along the way. Nothing created and made by man, ever happen with someone first creating it in their mind. For creativity to occur people also need time to think, to often today managers drive their staff non-stop making sure they have to do things constantly, some where they forget if you want creative ideas, and not more of the same old same old that has never worked, you have to give them time to actually think, without disturbance. It is unfortunate but today we value looking busy over actually thinking, many of our businesses would benefit far more from less meaningless activity and more time given to thinking. It would help tap into a great resource you already have, and would also go a long way toward creating a culture in which ideas drive the business, instead of chasing some competitor. I have followed you for many years now. I have just been given the job of leaning job change in one of our poor performing plants and as usual my managers want me to do lean to the job change. My strategy as always is to train, motivate and empower the people who do the job changes to lean their own operation/process. My problem is keeping space between my bosses and job change and isolating the job change guys from measurement that drive the wrong behaviours. What strategies can I use to give the Adelaide Job Change Team the space and time to lean themselves. ( The Adelaide Job Change Team is totally on board and cannot wait to get started ).